This is part of the hunt for less sodium website. There is a process called leaching that is used in renal failure to reduce the potassium in vegetables so I decided to try leaching salt from bacon. Previous experiments with cheese showed that flavour leaches out just as fast as the salt. As I had some smoke flavour on hand I thought there could be a chance that some flavour could be preserved. 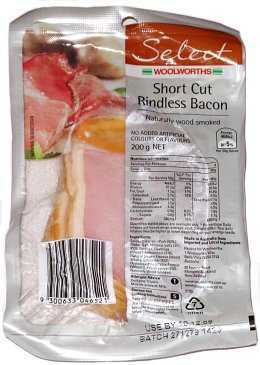 A visit to Woolworths produced a bacon that showed a lowish sodium level and I assume would be available Australia wide. I think it is fairly unique as other bacons I have seen in supermarkets have sodium levels ranging from 1000 to 1950mg/100g. Quite lean at 15g/100g total fat. The slices were about 3mm thick. Do not use the similar product that is "Thick sliced" as it will take longer for the salt to diffuse out. Liquid Hickory Smoke is available from. In order to reduce the introduction of bacteria I boiled 2 litres of water for 5 minutes and let it completely cool while covered. One litre of the cool water was placed in a glass dish (20 x 15 x 6 cm) with 2 teaspoons of smoke flavour. 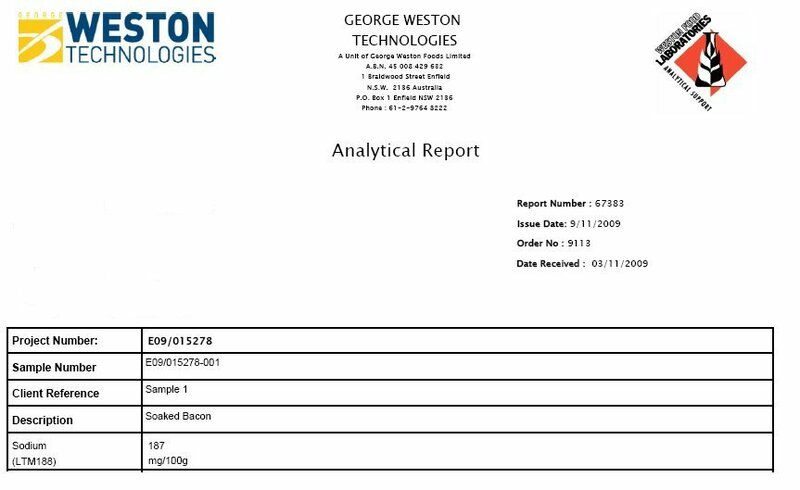 The bacon was rinsed in the remaining water then placed in the dish as shown below, covered and refrigerated for 24 hours. In order for all the surface to be exposed to the water the bacon was rearranged after about 12 hours. Note how the slices were interleaved to allow access to the water. After 24 hours the bacon was removed, drained and 2 slices were finely cut up and sent for analysis. I found it great in BLTs but it will disappoint if your palate is not adjusted to low salt. It had some smoke flavour and did not taste very salty. I would use 4 teaspoons of smoke for more flavour. Because the preservatives had been removed by the soaking it would have a short shelf life so we consumed it all within 2 days. The Lab. result showed a sodium level of 187mg/100g which is what I expected from the taste. There were 9 slices in the packet so each 22g slice contained about 42mg of sodium. A BLT made with 2 slices of toasted no added salt bread (90g), unsalted butter (10g), lettuce (20g), tomato (50g) and 2 slices of the soaked cooked bacon would have an overall sodium level of about 50mg/100g. To make a bacon and eggs breakfast (1 slice of bacon and 2 eggs) that comes in with sodium below 120mg/100g you will need to add some other very low sodium product. Placing the eggs and bacon on a slice of NAS toast or adding 50g of fried tomato will do the trick.